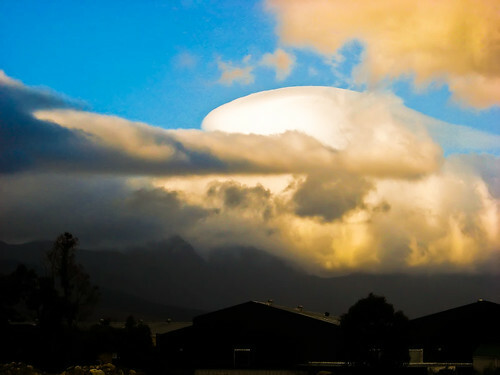 I spotted this cloud, probably lenticular, over the Hottentots-Holland mountains on Monday afternoon. This entry was posted in Photos and tagged Cloud, Sky, Weather. Bookmark the permalink. That is towards Sir Lowrey’s? No, above Somerset West. Looking from my house directly over, and at right angles to the N2, roughly where the BMW dealer is, if you saw that. Helderberg is just out of frame to the left. Cool, Got the picture now. That is about where the snow was lying when I was down there, on the highest peak.